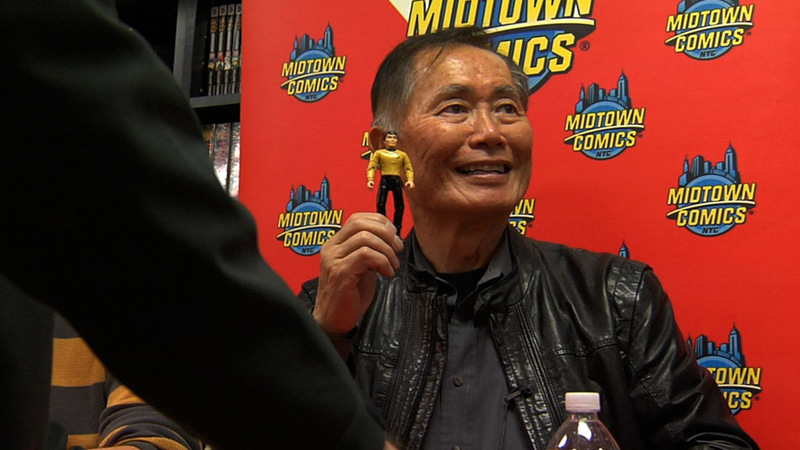 George Takei stars in Jennifer M. Kroot’s documentary, “To Be Takei.” Courtesy of Sundance Film Festival. Frequent Malick collaborator A.J. Edwards directs his first narrative feature exploring the early years of Abraham Lincoln. A late addition to the festival, Richard Linklater’s intriguing drama clocks in at 164 minutes and features Patricia Arquette and Ethan Hawke. Michael Fassbender tries his hand at comedy, playing an eccentric pop singer who wears a giant fake head at all times. The enormously photogenic trio of Emily Browning, Olly Alexander and Hannah Murray (of BBC’s “Skins”) star in a coming-of-age musical. John Slattery, of “Mad Men” fame, directs Philip Seymour Hoffman and Richard Jenkins in a film about a man desperate to bury the past. Shot under the radar in Chicago, Joe Swanberg’s latest stars Anna Kendrick, Melanie Lynskey and longtime Swanberg fan, Lena Dunham. Amir Bar-Lev, director of 2010’s shattering “The Tillman Story,” focuses his lens on Joe Paterno, Jerry Sandusky and Penn State University. “Arrested Development” vet David Cross directs an all-star comedy about a paranoid municipal worker played by “Veep”’s Matt Walsh. Microbudget auteur Lynn Shelton attracts her most impressive cast to date, headed by Keira Knightly, Chloë Grace Moretz and Sam Rockwell. Nawazuddin Siddiqui, previously featured in Prashant Bhargava’s “Patang,” stars in a drama set in contemporary working-class India. Based on the memoir of legendary film critic Roger Ebert, Steve James’s documentary promises to paint a comprehensive portrait of the beloved writer. On the heels of his acclaimed indie, “The Color Wheel,” filmmaker Alex Ross Perry directs Jason Schwartzman and Elisabeth Moss in a New York-set comedy. John Lithgow and Alfred Molina play a long-closeted couple who finally tie the knot after 39 years together in this film by Ira Sachs (“Keep the Lights On”). Jeff Preiss’s biopic on jazz pianist Joe Albany stars two of the best—and most undervalued—actors in the business, John Hawkes and Elle Fanning. First-time feature documentarian Tessa Louise-Salomé delves into the fascinating life and work of French filmmaker Leos Carax (“Holy Motors”). Cousins Tracy Droz Tragos and Andrew Droz Palermo (cinematographer of “You’re Next”) direct a vivid nonfiction vignette of small town America. Magnificent character actor William H. Macy directs a musical drama offering a showcase role for the ever-underrated Billy Crudup. Two of SNL’s funniest recent escapees, Bill Hader and Kristen Wiig, play estranged siblings in this comedy executive produced by the Duplass Brothers. At the peak of her comedic powers, Amy Poehler is cast in a romantic comedy opposite Paul Rudd and directed by David Wain (“Role Models”). If Jennifer M. Kroot’s documentary is a fraction as entertaining as George Takei’s Facebook statuses, it is guaranteed to be a must-see. “Persepolis” creator Marjane Satrapi directs her second live-action feature, a bizarre comedy about a man (Ryan Reynolds) who can talk to his pets. The great Catherine Keener plays a brooding American wrestling with unspoken demons in Mark Jackson’s Italy-set drama. After winning last year’s jury award for his short, “Whiplash,” Damien Chazelle presents the feature version, starring J.K. Simmons and Miles Teller. Meanwhile, Teller’s “Spectacular Now” co-star, Shailene Woodley, is the lead in Gregg Araki’s latest coming-of-age drama. For a complete list of the films screening at the 2014 Sundance Film Festival, click here.